The Mike Cottrell College of Business serves business and technology students across all five UNG campuses and currently enrolls more than 20% of the entire UNG student body. The college prepares students to lead in the workplace and strengthen their communities through academic excellence, experiential learning, innovative teaching, as well as, entrepreneurial and ethical leadership development. Students learn the skills and expectations necessary to become strong and effective leaders in their future careers. In addition, the Mike Cottrell College of Business is a valued partner in regional economic development. The 2016-2017 Mike Cottrell College of Business annual report is now available. If you would like a physical copy of the report please contact Bobbi Larson, development officer via email at bobbi.larson@ung.edu. The Mike Cottrell College of Business educates students to become ethical business professionals and prepares them to serve as leaders in their communities and in the global marketplace. engaging in meaningful outreach and service. The Mike Cottrell College of Business' vision is to build strong graduates and strong communities. For an outline of how the college plans to accomplish this vision through the year 2020, please download our Strategic Plan. As a college who prides itself in our efforts to produce an ethical and knowledgeable workforce for our north Georgia communities and around the globe, we believe that an understanding of business ethics is a critical component to any well-rounded business school graduate. Represent the Mike Cottrell College of Business in all that we do as the reputation of our college is critical to our students’ long term success. Be honest to ourselves, our administration and fellow faculty members, our students, and our community in all of our teaching, research, and community service endeavors. Mike Cottrell is a Dahlonega resident and leading entrepreneur in the north Georgia region. Cottrell designed truck transports for his father’s company, Cottrell, Inc., before purchasing the company in 1987. In less than a decade, Cottrell bought out his major competitor and in 1999, he initiated international sales. By 2006, Cottrell, Inc. was manufacturing more car haulers than all other major international manufacturers combined. Cottrell, Inc., with approximately 500 employees, is the number one manufacturer and marketer of over-the-road car haulers in the world. 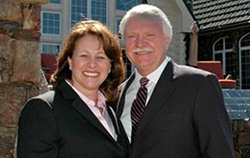 Because of their love for the region and interest in its economic success, in 2006, Mike and Lynn Cottrell made a transformational gift of $10 million to initiate the university’s first-ever capital campaign and to support the university’s educational mission and the opportunities it provides to students. This endowment has allowed the Mike Cottrell College of Business to develop and sustain excellent programs and opportunities for students and faculty. This gift provides student scholarships, student funding for external opportunities such as international study tours and internships, and faculty funding for research and professional activities. The gift also established the Center for Entrepreneurship and Innovation (formerly Center for the Future of North Georgia), which focuses on regional economic development activities, entrepreneurial opportunities, student opportunities to interact with business executives, and internships. This organization collaborates with regional economic development agencies to serve existing and prospective industries throughout north Georgia. Cottrell is a trustee emeritus of the university’s Foundation and served as co-chairman of Living Our Values: The Campaign for North Georgia. He is former vice-chair of the Advisory Council for the University’s Mike Cottrell College of Business and has received numerous honors for his philanthropy, including an honorary doctorate. The Mike Cottrell College of Business is accredited by the Association to Advance Collegiate Schools of Business (AACSB)* and is the only business school in the northeast Georgia region to receive this esteemed accreditation. Founded in 1916, AACSB International is the longest-serving global accrediting body for business schools that offer undergraduate, master’s, and doctoral degrees in business and accounting. AACSB accreditation is the hallmark of excellence in business education and has been earned by less than 5% of the world’s business programs. *Degree programs accredited by the AACSB include the bachelor of business administration, the bachelor of applied science in technology management, and the master of business administration program. The Mike Cottrell College of Business Certificate in Paralegal Studies, Associate in Paralegal Studies, and Bachelor’s of Applied Science in Technology Management, Paralegal Concentration, are all approved by the American Bar Association (ABA). The ABA is one of the world’s largest voluntary professional organizations is committed to supporting the legal profession with practical resources for legal professionals while improving the administration of justice, accrediting law schools, establishing model ethical codes, and more. The ABA first established guidelines for the approval of Paralegal Education programs in 1974 and has since become a measure of quality for programs in the United States. In order to receive ABA approval, institutions must fully satisfy all requirements of the ABA guidelines and participate in full evaluation every seven years as well as submit regular interim reports between visits that are monitored by the ABA Standing Committee and its Approval Commission. **Paralegals may not provide legal service directly to the public, except as permitted by law. Georgia prohibits the practice of law by non-lawyers.